The percentages for each month shown are the accuracy of our stock picks (percentage of winning trades) and the average percent gain per stock pick in the direction of the signal. Percent returns are calculated ONLY within the first 8 weeks after the stock is posted to show the effectiveness of the system. Our method maximizes returns using our short-term profit-focus strategy with explosive technical setups that can potentially deliver maximum reward at minimum risk. Stocks that do not appreciate by > 5% in their predicted direction are considered losing trades. Click on a specific month for details of stocks posted. Also, starting in August 2011, we will only select one stock pick per week (listed for Monday). The performance table (above) is summarized in the performance chart (below). The light green area shows the percentage of winning trades for our stock picks. The dark green area shows the average return per stock pick of the maximum percentage gain in the direction of the trade signal. This does not imply a trader will achieve these results. We offer this service to help you enhance your trading skills through use of technical analysis. 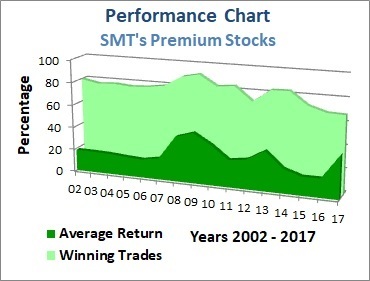 Hopefully, you will consider becoming a member of SMT's Premium Stocks. Copyright © 2000 - 2018 StockMarketTiming.com, LLC. All rights reserved.